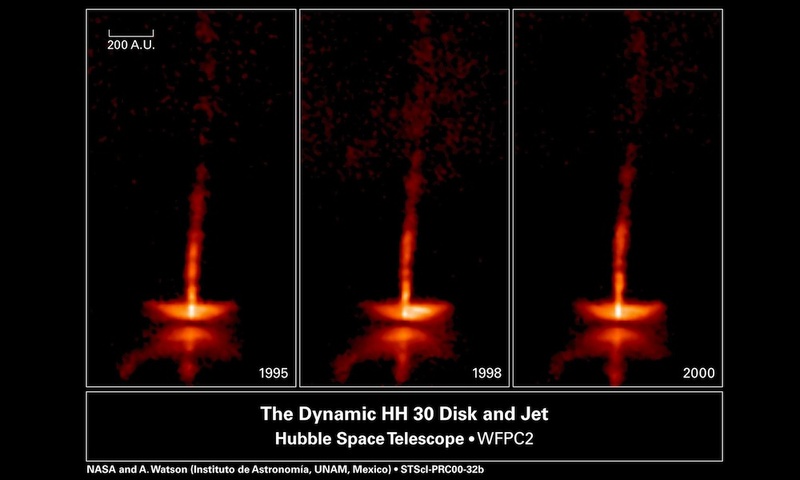 An example of a collimated jet in space: images of the young stellar object HH 30, showing changes over a five-year period in the disk and jets of this newborn star, which is about half a million years old. Streaming jets of high-speed matter produce some of the most stunning objects seen in space. Astronomers have seen them shooting out of young stars just being formed, X-ray binary stars and even the supermassive black holes at the centers of large galaxies. Theoretical explanations for what causes those beam-like jets have been around for years, but now an experiment by French and American researchers using extremely high-powered lasers offers experimental verification of one proposed mechanism for creating them. In their results, the researchers show evidence of the “shocks” predicted by theory, and which give the mechanism its name. These shocks are surfaces in space where there is a sudden change in the density, speed, and direction of a flow. According to theory, which is consistent with the new experiment, they are what cause the beam-like nature of the jets to form. In the paper published in Physical Review Letters, and highlighted as an editor’s suggestion, the researchers explain how they used the laser laboratory facility, LULI, at the Ecole Polytechnique in France, to recreate these space jets. Collaborators at the University of Chicago supplied a sophisticated computer code FLASH that they developed and adapted to help analyze the results. With nothing to prevent the resulting iron plasma from spreading out, it would flow quasi-spherically from the target. In order to see the effects of a surrounding wind, the researchers generated another lighter, supersonic plasma from a plastic ring surrounding the central target. The researchers found that the interaction of the two plasmas sharply collimates the iron plasma flow. That is, rather than spreading out in all directions, the iron flow emanates primarily along a single direction. 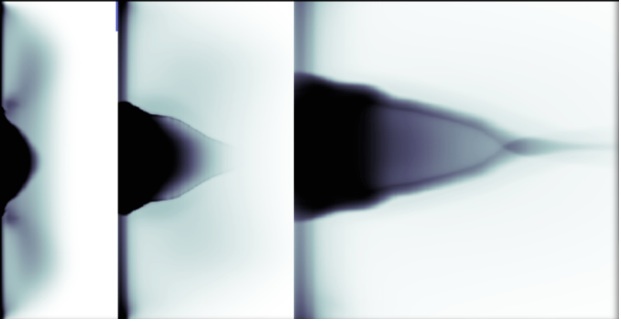 The experimental datashowed that a shock wave is generated in this interaction, which helps the momentum and inertia of the plastic outer wind to collimate the inner iron flow into a jet. The experiment is an example of laboratory astrophysics, a rapidly growing area of high energy density physics that requires the collaboration of astrophysicists, experimental plasma physicistsand computational physicists. It is a field in which researchers at the University of Rochester and at the Ecole Polytechnique are involved on multiple fronts. The team of collaborators also included R. Yurchak, A. Pelka, T. Vinci, M. Koenig, and A. Benuzzi-Mounaix from the Ecole Polytechnique, France; S. Pikuz from the Joint Institute for High Temperature RAS in Moscow, Russia; E. Falize and B. Loupias from CEA-DAM-DIF, France; and M. Fatenajad, P. Tzeferacos and D. Q. Lamb from the University of Chicago.